Iron Girl slot has a sci-fi world theme that isn't too dissimilar to the long-defunct Playtech Iron Man games although the game mechanic is very different. Play'n Go haven't used this subject matter before although numerous other developers have - think Yggdrasil's Reptoids or Quickspin's Big Bot Crew which are perhaps the games which match closest here. The game doesn't look very detailed with plain blue reels set against a blue cosmos background and some gentle futuristic music while we spin but if I tell you 'villains' feature here, is our bankroll in danger of being stolen fast? A straightforward start with a standard 5x3 grid on which symbols can appear stacked and as we shall discover, a pretty straighforward game mechanic too. You have essentially got 2 main parts to this 20-line slot, the four card suits all paying 2.5x for 5-of-a-kind and four 'Villains' which are droid-type characters and they pay 10x for Blue, 7.5 Pink, 6x for Green and finally 5x for Orange. 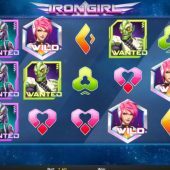 There are Iron Girl Wilds but no scatters therefore no triggered bonus rounds, but there are one or two in-play features. If you get any win landing consisting of one of the 'Villains' this win plus any Wilds forming it will be frozen for respins until no further matching Villains or Wilds are added, similar to games like Barber Shop Uncut. Any Wilds and Villains on the screen but not involved in the initial win will also be frozen. There is a meter above the reels and this has a scale which counts your total winning tiles in view and can add 'Bounty Bonus' multipliers to the final total. Should your grid consist of 8 or 9 Villains you don't get a multiplier but 2 randomly-placed Iron Girl Wilds added to hopefully increase the final total. 10 or 11 will earn a 2x multiplier on the final total. 12 or 13 earns a 3x multiplier on the final total. 14 r full grid of 15 earns a 5x multiplier on the final total, so if this occurred on the top-paying Blue Villain you would have 20x10x5x bet or the game's top win of 1000x stake! 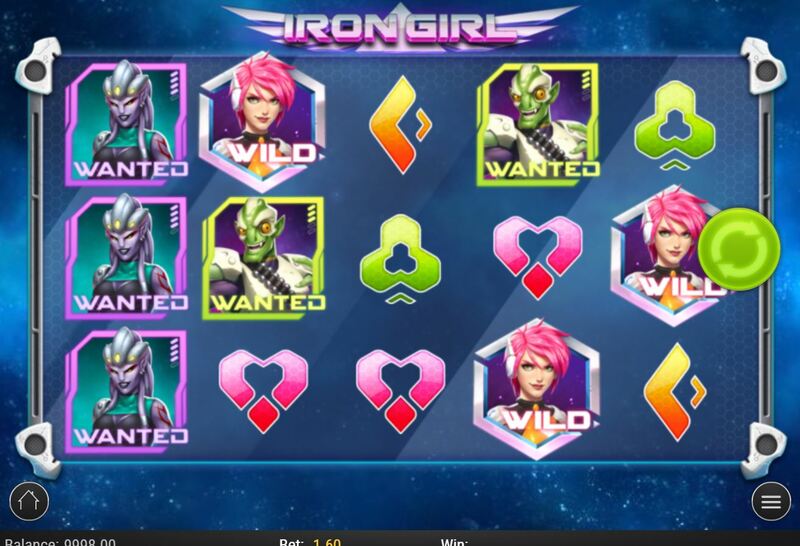 On any spin in the base game (not respins) the Iron Girl bonus may occur and 2 to 5 random Wilds are placed on the grid. This may help to trigger the respins as described above.